There were 44,295 registered patent practitioners in the U.S. as of April 2016. After 20 years on the USPTO roster, at least 15% of practitioners originally registered between 1988 and 1996 are no longer registered as of April 2016. Going back from April 2016, every subsequent year before 1986 shows an additional 2% of patent practitioners are no longer registered. The USPTO either skipped or removed a large number of registration numbers originally to be assigned in 1964, 1966, and 2001 for currently unclear reasons. The number of practitioners removed from the USPTO database reveals a practitioner percentage removal trend that can be seen as a retirement estimate for patent practitioners. This trend shows that the longer a practitioner has had a registration number, the more likely they are to have retired, or otherwise been removed, from the roster. The chart below shows the percentage of patent practitioners who still remain registered on the USPTO roster as a function of each practitioner’s year of registration. The further to the right, the more recently the practitioner earned their registration number. From the graph above, there appears to be an initial sudden dip at 1996 that suggests that about 15% of practitioners leave the practice after 20 years of being registered agents and attorneys. 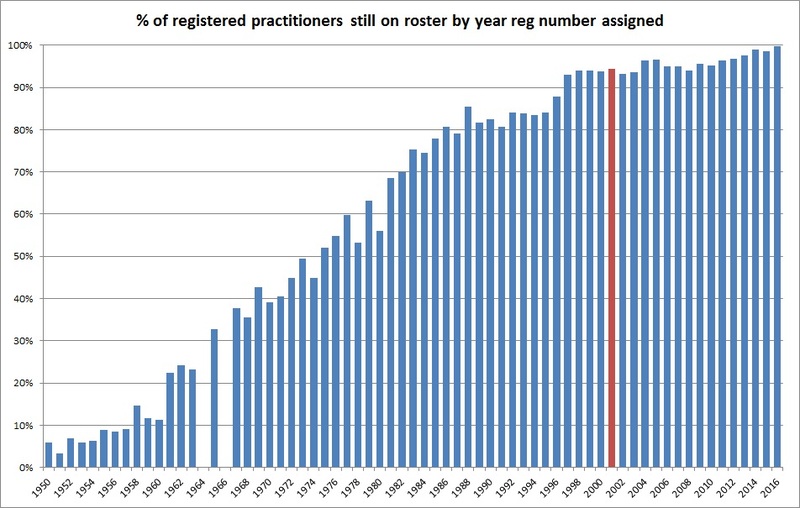 These numbers stay fairly level for another 10 years on the roster, or back until 1986 before another large dip in the percentage of practitioners still registered. The trend after this first 30 years on the roster is a nearly linearly removal at a rate of approximately 2% a year. This retirement pattern continues until 55 years after initial registration, or 1960 in the above chart. At the time this data was collected, there were 44,295 individuals in the USPTO database, however there are likely far fewer than this actively filing or prosecuting patents with the USPTO. The percentages of practitioners still on the roster are very likely to be higher than in actual practicing attorneys and agents. Remaining on the roster is relatively costless for a practitioner due to the lack of dues and continuation education requirements. It is likely that many practitioners have effectively retired without yet being removed from the roster. Accordingly, the percentages shown on the above graph are a ceiling of the actual figures of practitioners who are actually still practicing. The above retirement graph was generated from percentages of practitioners removed from the USPTO database. Finding the percentage of those removed can be a challenge, however, as the USPTO only maintains the current state of the patent bar in its public database and does not publicly provide a list of all practitioners ever registered at the USPTO. Instead, the Office of Enrollment and Discipline periodically conducts a mandatory survey of active registered practitioners pursuant to 37 C.F.R. § 11.11. This survey, in part, determines if the practitioner is still active and wants to remain on the USPTO roster. As noted above, there is essentially no cost to remain on the roster as there are currently no annual dues or continuing education requirements. However, if a practitioner is no longer practicing and either indicates the end of their practice in the survey or does not respond to the survey, the USPTO removes that practitioner from the roster. The below graph is constructed with the knowledge that practitioners can be removed through this survey system and by assuming that the USPTO assigns numbers in a sequential order. 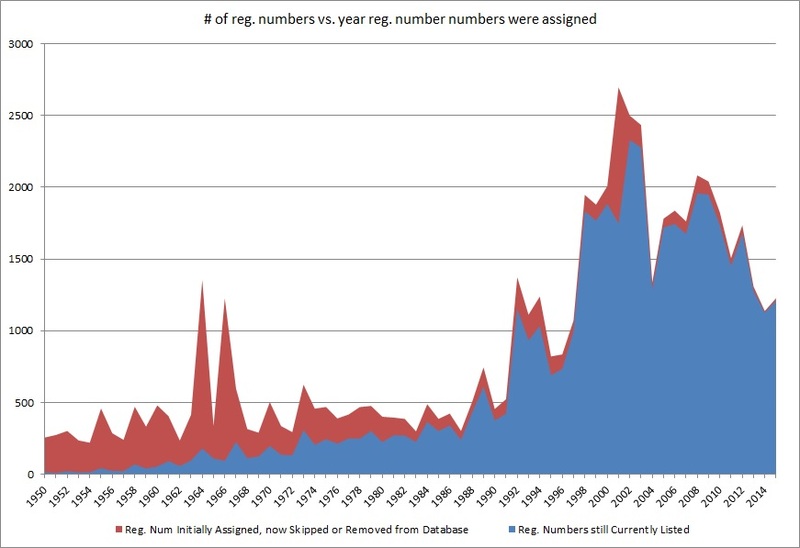 This visualization shows the number of registration numbers removed each year compared to the number of registration numbers initially assigned in that given year. For instance, while the USPTO roster may include 1,210 practitioners who first gained registration numbers in 2015, the first registration number assigned in 2015 (i.e. 73,303) compared to the last registration number assigned in 2015 (i.e. 74,530) suggests that 1,227 registration numbers were actually assigned in 2015 and that some of these 2015 practitioners have already been removed from the database. Carrying out this calculation for each year going back to 1950 yields the graph below. As noted above, there are unusual red spikes in 1964, 1966, and 2001. The red spikes corresponding to 1964 and 1966 are far out of place and I believe they are likely outliers. The red spike in 2001 IS an outlier. This can be said with confidence based on comparison to number of practitioners found in the USPTO Gazette for the year of 2001. Potential practitioners in the PTO Gazette are listed provisionally to allow time for the public to report any additional information about the practitioners before they formally receive a registration number. 1,853 potential practitioners were listed for 2001 in the USTPO Official Gazette compared to the calculated value difference of 2,697 between the first registration number assigned in 2001 and the last. The corrected graph below reflects the modified value for 2001 based on the Official Gazette listings. Unfortunately, the listing of potential practitioners in the online resources of the Official USPTO Gazette currently only goes back as far as 1995 and can’t be used to find values for 1964 and 1966. The outlier variation in 2001 is likely due to a conscious choice by the USPTO to jump to a higher registration number for assignment rather than adhere to a generally sequential and quantum assignment of registration numbers. This is likely true for 1966 and 1964 as well. For example, at the end of 1966 the last registration number assigned was 23,099 which is followed by a jump to 24,002 on the very next day numbers were assigned. These gaps suggest that there may have been a USPTO policy at the time to skip blocks of numbers and perhaps start at the next round number in the sequence (e.g. 24,000 in 1967) at the start of a next year. The USPTO provides both a database for practitioner information as well as a zip file of this data in spreadsheet form that is updated daily. However, the spreadsheet provided by the USPTO does not include the dates of registration as an attorney or agent. Accordingly, the process of retrieving the registration date information from the USPTO online database was automated with web macros to yield the data that is analyzed in this post. As many practitioners have been registered as both patent agents and as patent attorneys, only the date an individual first received a registration number was used for this analysis. For access to the data set being used, or if any errors are noticed, please feel free to reach out by email. This article is a continuation and extension of my previous analysis on the USPTO database graphing the USPTO attorney and agent database as well as my update to that story as of April 30, 2016. Editor’s note: Comment moderation policy is in effect. Excessive or uncivil posts will be deleted without further notice. In both the decision to institute and the final decision, the PTAB assumed that the petitioner had demonstrated both motivation and expectation of success when it set forth a primary reference, and two secondary references, and then required the patent owner to rebut with evidence and argument the petitioner’s unsupported assertions assuming that the petitioner had proven obviousness. The Federal Circuit reversed. In particular the Federal Circuit rejected an argument by the PTAB that once the decision to institute was made, the burden of production/persuasion shifted to the patent owner. The Federal Circuit observed that while this might be the way patents are prosecuted in ex parte prosecution with the examiner shifting the burden by showing all elements in the prior art, that is not what the statute governing IPRs requires. It places the burden of proof on the petitioner and that never shifts. combine the prior art references, without first requiring McClinton to provide evidence to support its assertions. shearable threads, as taught by Cockrell (Ex. by the petitioner and not supported by record evidence. The Federal Circuit also brushed aside the PTOs assertion that the argument that the petition had not established a prima facie case was effectively an attempt to appeal an institution decision in violation of Cuozzo. The problem was that the final decision relied on findings made by the PTAB in the institution decision that were alleged to be incorrect. The Federal Circuit agreed with the patent owner, Magnum. or enter my own post on that case? Wow – thanks Ned. There are several layers of really good stuff in this decision and I do hope it is explored on a thread of its own. Noting that I have not yet read the decision myself, and going off of your synopsis here, it appears that the CAFC wants to treat the petitioner as the “examiner,” and completely remove the Office from that role, instead making the Office play the “neutral” part. I can see great difficulty in making that transition, given that the bulk of the PTAB judges view themselves as “super-examiners” with more of an eye towards eliminating patents than an eye as a judge of what two other parties (petitioner and patent holder) bring to the table. IF the Office actually implements post grant review in a truly neutral manner, I would be (pleasantly) amazed. There are probably a lot of us who feel the very same way about what happened in our own IPRs where effectively the assertions of the petitioner establish a prima facie case (pretty much like in ex parte examination) requiring the patent owner to effectively prove patentability. Also, I think a lot of use also believe that the PTAB takes an adversary position vis-a-vis the patent owner, making itself an advocate as opposed to a panel of judges. And down below, have you decided not to walk with me…? Interesting chart. For decades, just under 500 new registration numbers per year. Then the Federal Circuit is created and the number begin to grow to an average of around 800. In the mid ’90s, we have Alappat, Beauregard and then State Street Bank. The business of business method and software patents causes a great leap in demand. The average jumps to 1800 per year. Then in 2008, Bilski at the Federal Circuit and in 2010, Bilski at the Supreme Court. Demand plummets. After a small uptick in 2011, the AIA kicks in with the IPR. Demand and/continues to plummet. With the uptick in 2015, it appears the new level might be around 1200 per year. But it might also be that the plummet will continue. What does this show? Clearly the Federal Circuit has had a major impact on patent value. After a strong expansion of patent strength and scope of patentable subject matter, the demand for patent attorneys increased strongly. Then the public backlash over business method patents and trolls led to Bilski/IPRs. After that, it is all downhill. I do not think we have reached bottom yet. Unless Congress acts to repeal IPRs or the Supreme Court does it for them, I think the average will return back to around 800 per year, and it could be worse than that. I think that your “clearly” is not so clear, and you omit many other outside developments. Shoehorning your favorite “stories” (read that as fabrications) into the graph just does not work. Ned, there are lots of other variables at work re new PTO registrations per year. In particular, the huge decrease in corporate in-house patent attorneys, both from the two economic crashes in recent years, AND the great increase in the use of “outsourcing” of patent prep and prosecution [as well as litigation], and doing so on a competitive prices basis. Both may require less patent attorneys and agents, but it appears to experienced examiners and many others to have also led to lower quality patent applications. Then on top of that there is the typical huge student debt to go through both engineering and law school these days with the huge increase in tuition and other costs. Thank you Paul for providing an example of someone making the same point. I was unaware of the Maier article. Am I missing something though? Is there no rebuttal? I was looking for arguments that support the continuation of something Congress removed in the face of this additional point. The rebuttal is that with AIA 35 USC 273 protecting trade secret commercial users from anyone else getting a well deserved patent for an independent re-invention that informs the public to advance the useful arts and recovering from the secret users infringement, there is far less of a valid argument for the equitable doctrine of Metallizing doctrine [which is NOT about prior art] being sub silento overruled by the change in 102 prior art to eliminate secret “on sales” of products containing the invention as prior art. You can argue that all you want, but I have yet to find anyone who will argue with a straight face that the Sup. Ct. is really going to enforce a patent not filed until 20 or more years after the invention has been in commercial use by the applicant as a trade secret. I was looking for a rebuttal with a cognizant legal basis – not the same conclusory repeated “the Court would never go for that” (which does not qualify for a cognizant legal rebuttal). Let’s not forget that this is yet another sign in addition to the multitude of other points that I have made (and that DO qualify as cognizant legal points). Anon, do you agree or disagree that Congress does not have the power to secure exclusive rights to inventors for Unlimited times. Trade Secret time of protection is distinct and separate from patent protection time. Tell me Ned – do you agree with this? Under what basis do you conflate two very different areas of protection? You do realize that these ARE two different areas of protection – arising under two different parts of the Constitution, right? Please do more than offer an unsupported and conclusory “No,” as that type of answer is nowhere close to being compelling. Please do more than offer an unsupported and c0nclus0ry “No,” as that type of answer is n0where close to being c0mpelling. Further question for you Ned – Can Trade Secrets (even if just in theory) be held for an Unlimited times? Come back Ned – take a walk with me on this topic – one step at a time if we need to go slowly. Anon, trade secrets can be held indefinitely provided they are kept secret, and the law now provides significant legal assistance to the trade secret owner to prevent unauthorized disclosure. But you know the policy interface with patents from having read Pennock v. Dialogue. The Supreme Court was concerned about the case where the inventor keeps a monopoly on the commercial use of invention by keeping secret its manufacturing or other techniques, and then, when others begin to learn of the secrets, filing for and obtaining exclusive rights for a fixed term. The Supreme Court was concerned this this was in violation of the constitutional mandate on a number of levels. But of course you knew this. Once again you are OVER-reading a Court case, and missing the deference to the controlling Legislation at the time of Pennock to which the Court itself holds. The Court is not taking authority out of the blue in Pennock – but rather is building on the foundation of what Congress had in place at that time. The AIA has changed the foundation. As I have suggested, read Pennock again but without the adoration of placing the Supreme Court above the Constitution. Then read the copyright case (dealing with the same Constitutional clause) of Golan v. Holder. Then come back and take the first step with me (without tripping on “policy”). Yes, I am very very very well aware of what happened back then in Pennock under a different set of Patent Laws. Now, can we have a direct answer from you on the two items here? Second, take the next logical step of your admission of UNlimited times for Trade Secrets and what that – in and of itself – does to your very own question at 2.1.1.1.1. Hint: your own admission wrecks your position, and points to the fact that there are – and must be – different protections – coming from different portions of the Constitution, and providing for different timings. The next step for you to take once these items that I have provided sink in, is for you to realize that “policy” has been changed by the branch of the government AUTHORIZED both to deal with policy and to write patent law. Once you realize these things, then it is very easy to understand – and not conflate – that the time under patent protection – and only patent protection – has no Constitutional problem because the ACTUAL time (not a mismatched combined “effective” time) IS limited. One (major) problem with the old math was the lack of realization that no matter how long an item was held as a Trade Secret, that time ENDED with the transition to the realm of patent protection. This means that ANY “effective time” could no longer reach the unlimited aspect of only that available under the Trade Secret domain of protection. But of course you knew this (because I have spoken of precisely this to you previously). I do not accept you premise that when the SC talks about the constitution that is interpreting statutes. It does not matter whether or not you “accept” my proposition, Ned. You still have not taken that next step. Not only is that patently false, you – as a sworn attorney – have an ethical obligation to place the Constitution first – above all three branches of the government. If you want to share the actual oath you took once upon a time, I would be happy to point this out to you. Are you going to continue to walk with me? Your reply at 2.1.1.1.1 needs some life support. It is no accident that the trend for Trade Secret protection is ramping upwards (both in afforded protections and the use of those protections by “the public**”). Pardon the detour, but this is also why the AIA and the Soliloquy speak true to the new “New” in patent law: what is “new to you” is still patentably new. The elevation of this view can be seen in the elevation of the concept of Prior User Rights. It is not without some rather high degree of irony that I recall that Ned Heller himself had once proudly claimed some part of the introduction of the more limited Prior User Rights legislation by Congress. The irony comes in multiple layers. One such layer is the fact that having even such a limited response actually cements in place the fact that business methods – as a category – are to be generally considered patent eligible. The reasoning is easy and crystal clear: had this not be the case, no such PUR would have been needed, as all it would have taken is a simple statement that business methods de facto do not fall within either the category or within the Useful Arts. Everyone is aware (or should be) of Ned’s Windmill Chase against business methods, so it perhaps fitting that something he prided himself on as having helped birth defeats his own views on the topic of his favorite Windmill. It is also ironic that Ned continues to fight (without a legal ground) against what plainly happened in the AIA vis a vis the removal of the personal penalty (from title as well as content) of the separate-by-area-of-law protections of Trade Secret and Patent protection; while the vehicle of his “proud” PUR has been used to add further “legitimacy” to the ability to practice Trade Secrets with impunity to those who would otherwise submit to the sharing and publication required for actual patent rights. One needs to take a step back and contemplate what this means as to the thinking of Congress towards Trade Secrets. This was NOT a small change. Prior to the AIA (in large part), the fact of the matter – and part and parcel of the “Metallizing Doctrine” effect was that if one engaged in NOT sharing and instead opted for Trade Secrets, one put oneself at risk to be labeled an infringer for some LATER person obtaining a patent on the very item that was protected by Trade Secret. It did not matter AT ALL whether or not you had arrived at the invention point earlier – the later granted patent REMOVED your ability to practice your Trade Secret protected item. This was colloquially known as the “Stick” portion of the dual nature of patent protection (the other portion known as the “Carrot” portion). Congress sent a very clear signal against this doctrine by removing the Stick. NONE of the supporting arguments that I have seen for continuing the Metallizing doctrine take this sea change into account. ** Separately, but most definitely related, the notion of “the public” includes the juristic person of the corporation. It is no accident that this particular portion of “the public” has garnered an outsized “voice” with the legislature, up to and including the notion of capturing the legislature, given the effects of Citizens United. I footnote this though, because this is a separate matter deserving its own scrutiny, and stands quite apart from the law that is patent law already written and passed by Congress, no matter which voices were ringing in their collective ears.